OpTon is an adware program which is installed as a browser hijacker. The application is likely to be distributed by other free programs, so if you want to prevent coupons and advertisements, you should always pay attention to the information provided by the installation wizards. OpTon works on Internet Explorer, Google Chrome and Mozilla Firefox. Once installed, the application gets access to your information related to your browsing experience. OpTon records your search terms, clicks, and other non-personally identifiable information. Moreover, it has a capability to manage your extensions and themes. We recommend that you remove this application, because instead of adding functionality to your browsers it only disturbs you with annoying pop-ups, which are likely to appear at the bottom of the page. 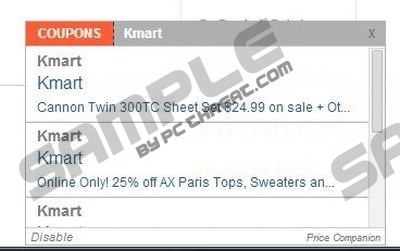 OpTon pop-ups include web banners, pop-up advertisements and coupons. If you have OpTon on your computer, you must have noticed that some of the advertisements may have nothing in common with your interests. It is so because the application is supported by numerous advertising servers, which send their advertisements to your computer. Bear in mind that OpTon is not associated with advertisements. OpTon does not endorse the activities of the websites to which you are redirected, which means that you are the only person responsible for your interaction with the application. If you are redirected to a website that you do not know, do not purchase or download anything from it before you make sure that the website is reliable. There are many corrupt websites that may seek to obtain your personal information and money or make you download malware. In order to prevent damage and data loss, you should avoid unknown websites and keep the system protected against adware, browser hijackers and other threats. Our team recommends that you remove OpTon from the computer once you find that your browsers are afflicted. Automatic removal is by far the easiest way to get rid of the adware program; hence, we suggest using SpyHunter. This application will remove OpTon for you and shield the system from various threats. You will save your time and energy because the application requires little interference. In case you are determined to remove OpTon manually, use the following instructions but do not forget to scan the computer once you delete the program. Do not forget to scan the computer once you finish the removal of the adware program. Click the button below, download and install the scanner, and launch a system scan. Quick & tested solution for OpTon removal.